Halley's Comet passed perihelion in its twenty-second known passage, as calculated from records by Chinese astronomers. J. R. Hind discovered asteroid #27 Euterpe. J. Palisa discovered asteroid #155 Scylla. While experimenting with electricity at the University of Wurzburg, Wilhelm Roentgen discovered X-rays. A. Charlois discovered asteroid #438 Zeuxo. K. Reinmuth discovered asteroid #3416 Dorrit. M. Laugier discovered asteroid #1755 Lorbach. M. Laugier discovered asteroid #1690 Mayrhofer. C. A. Wirtanen discovered asteroid #2044 Wirt. NASA launched Pioneer 2 (Able 3) as an attempted Lunar orbiter, but the third stage failed to ignite. Pioneer 2 (Able 3), launched 8 November 1958 from the Atlantic Missile Range at Cape Canaveral, Florida, using a Thor-Able booster and the Air Force acting as executive agent for NASA, was the last of the three project Able space probes designed to probe Lunar and cislunar space. Shortly after launch, the third stage of the launch vehicle separated but failed to ignite, and Pioneer 2 did not achieve its intended Lunar orbit. The instrumented payload spacecraft attained a maximum altitude of 1550 km (963 miles) before reentering Earth's atmosphere at 28.7 N, 1.9 E over NW Africa. A small amount of data was obtained during the short flight, including evidence that the equatorial region around Earth has higher flux and higher energy radiation than previously considered and that the micrometeorite density is higher around Earth than in space. Pioneer 2 was nearly identical to Pioneer 1. It consisted of a thin cylindrical midsection with a squat truncated cone frustrum on each side. The cylinder was 74 cm in diameter and the height from the top of one cone to the top of the opposite cone was 76 cm. Along the axis of the spacecraft and protruding from the end of the lower cone was an 11 kg solid propellant injection rocket and rocket case, which formed the main structural member of the spacecraft. Eight small low-thrust solid propellant velocity adjustment rockets were mounted on the end of the upper cone in a ring assembly which could be jettisoned after use. A magnetic dipole antenna also protruded from the top of the upper cone. The shell was composed of laminated plastic. The total mass of the spacecraft after vernier separation but before injection rocket firing was 39.5 kg (86.3 pounds). The scientific instrument package had a mass of 15.6 kg and consisted of an STL image-scanning television system (which replaced the image scanning infrared television system on Pioneer 1), a proportional counter for radiation measurements, an ionization chamber to measure radiation in space, a diaphragm/microphone assembly to detect micrometeorites, a spin-coil magnetometer to measure magnetic fields to 5 microgauss, and temperature-variable resistors to record spacecraft internal conditions. The spacecraft was powered by nickel-cadmium batteries for ignition of the rockets, silver cell batteries for the television system, and mercury batteries for the remaining circuits. Radio transmission was at 108.06 MHz through a magnetic dipole antenna for the television system, telemetry, and doppler. Ground commands were received at 115 MHz. The spacecraft was to be spin stabilized at 1.8 rps, the spin direction approximately perpendicular to the geomagnetic meridian planes of the trajectory. Goethe Link Observatory discovered asteroid #2848. The US launched LJ-5 (Little Joe), an unmanned test vehicle, for a maximum dynamic pressure abort test, and qualification of the launch escape system and structure. The objectives were not met, the spacecraft did not separate from the launch vehicle. LJ-5 (Little Joe 5), the first of the test series with a McDonnell production spacecraft, was launched from Wallops Island on 8 November 1960 to check the spacecraft in an abort simulating the most severe launch conditions. The launch was normal until 15.4 seconds after lift-off, at which time the escape rocket and tower jettison motor ignited prematurely. The booster, capsule, and tower remained mated through ballistic trajectory, and the spacecraft was destroyed on impact because it did not detach from the launch vehicle. Failure to attain mission objectives was attributed to several possible causes. One of these was failure of the spacecraft-to-adapter clamp-ring limit switches. Another possibility was failure of the escape tower clamp-ring limit switches. A third was improper rigging of the limit switches in either of those locations so that vibration or deflection could have caused switch closure. Since the test objectives were not met, a repeat of the mission was planned. 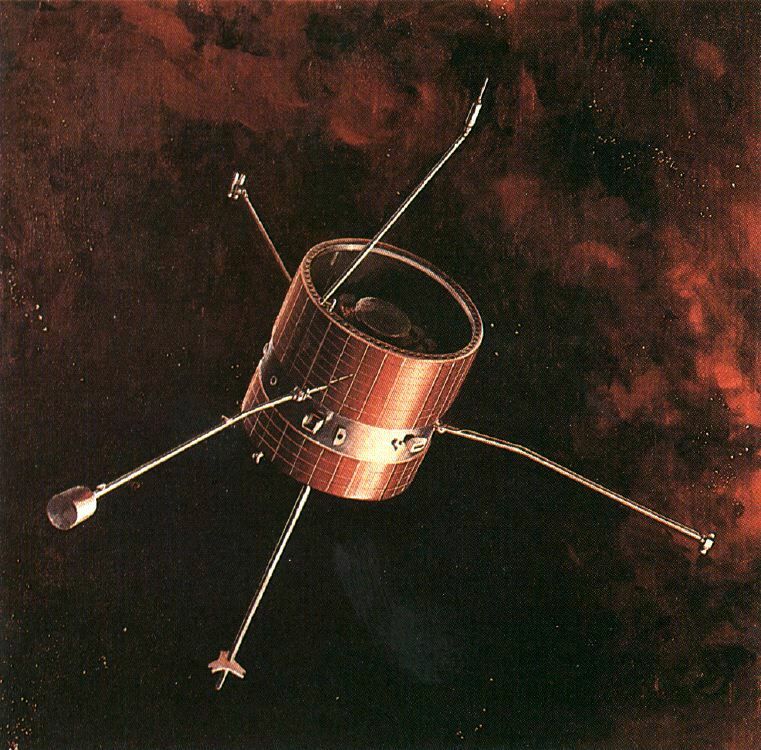 Pioneer 9 (Pioneer-D), launched 8 November 1968, was the fourth in a series of Sun orbiting, spin stabilized, solar cell and battery powered satellites designed to obtain measurements of interplanetary phenomena from widely separated points in space on a continuing basis. The spacecraft carried experiments to study the positive ions and electrons in the solar wind, the interplanetary electron density (radio propagation experiment), solar and galactic cosmic rays, the interplanetary magnetic field, cosmic dust, and electric fields. Also, a new data coding process was implemented for Pioneer 9. Its main antenna was a high-gain directional one. The spacecraft was spin stabilized at about 60 rpm, and the spin axis was perpendicular to the ecliptic plane, pointed toward the south ecliptic pole. By ground command, one of five bit rates, one of four data formats, and one of four operating modes could be selected. The five bit rates were 512, 256, 64, 16, and 8 bps. Three of the four data formats contained primarily scientific data and consisted of 32 seven-bit words per frame. One scientific data format was used at the two highest bit rates, another was used at the three lowest bit rates, and the third contained data from only the radio-propagation experiment. The fourth data format contained mainly engineering data. The four operating modes were real-time, telemetry-store, duty-cycle store, and memory readout. In the real-time mode, data were sampled and transmitted directly (without storage) as specified by the data format and bit rate selected. In the telemetry-store mode, data were stored and transmitted simultaneously in the format and at the bit rate selected. In the duty-cycle store mode, a single frame of scientific data was collected and stored at a rate of 512 bps. The time period between collection and storage of successive frames could be varied by ground command between 2 and 17 min to provide partial data coverage for periods of up to 19 hours, as limited by the bit-storage capacity. In the memory readout mode, data were read out at whatever bit rate was appropriate to the satellite distance from the Earth. A Scout rocket launched from Vandenberg, California carried Germany's Azur (German Research Satellite A) into orbit where it examined the Van Allen belts, solar particles and aurora. N. Chernykh discovered asteroid #3238. E. F. Helin and E. Shoemaker discovered asteroid #2430 Bruce Helin; E. F. Helin discovered asteroid #2099 Opik. E. Bowell discovered asteroid #2648 Owa. A 6 pound meteorite struck the home of Robert and Wanda Donahue in Wethersfield, Connecticut, the second meteorite strike of a home in the town in less than 12 years. NASA launched STS 51-A (Discovery 2, Shuttle 14) which deployed TELESAT-H (ANIK) and SYNCOM IV-1, and retrieved PALAPA-B2 and WESTAR-VI.